The still life flower lacquer painting was painted according to the original color of the objects to reflect the color effect. With black Ming style round-backed Chair as the frame work, the blue-and-white porcelain ware with white chrysanthemum in it as the main object, the color painting as the background, make a world of white, black and gray. The artist pursues the simplicity and conciseness of the lacquer painting language, and the elegance of the painting style of Song Dynasty. 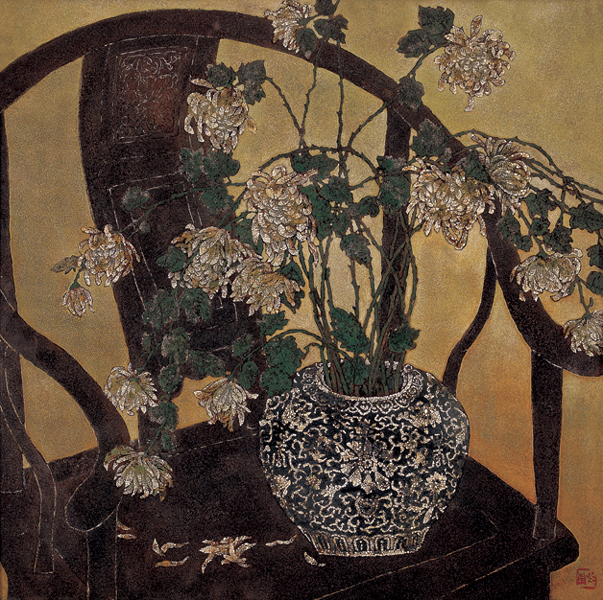 At the same time, he attached great importance to modern esthetic value and the unique feature of lacquer, trying to integrate classic charm with modern spirit in art. Li Xiaokang was born in Suzhou, Jiangsu in 1955. He graduated from the Fine Art Department of Nanjing Normal University in 1977. He engaged in advanced studies in as a student of lacquer art in 1994. He teaches in the Department of fine art in Arts and Crafts Department of Suzhou Television and Broadcasting University at present.